In the 19th century, one of the world's foremost researcher-writers on agriculture and horticulture lived 1858-1868 on his 3,500-acre plantation 2 mi. S of here, developing famous "central Texas nurseries" and experimental fields for new plant varieties. On this property gained recognition as one of earliest promoters and developers of conservation farming. Born 1812 in Scotland; came to the United States in 1832, soon starting in Mississippi one of the South's finest nurseries; gained wide fame as scientist and writer on agriculture. Before moving here, landscaped State Capitol grounds for both Louisiana and Texas. Surrounded Glenblythe mansion and guest houses (2 mi. S) with ornamental gardens and greenhouses, vegetable garden, orchard, a church, hospital, day nursery, store, homes, workshop, stock pens, flour and lumber mills. During Civil War (1861-1865) built ambulances, wagons; fed Waul's Legion in training camp near here. 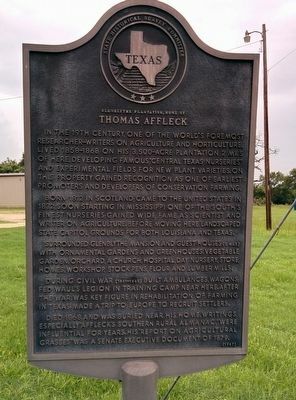 After the war, was key figure in rehabilitation of farming in Texas; made a trip to Europe to recruit settlers. Southern Rural Almanac," were influential for years. His "Report on Agricultural Grasses" was a Senate Executive Document of 1879. Location. 30° 16.25′ N, 96° 29.695′ W. Marker is near Brenham, Texas, in Washington County. Marker is on Farm to Market Road 390 south of Wolf Creek Road, on the right when traveling west. Touch for map. 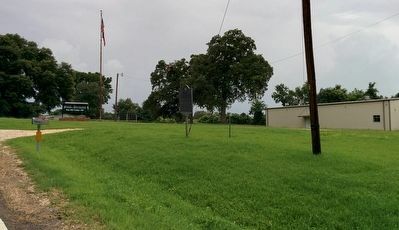 Marker is in this post office area: Brenham TX 77833, United States of America. Touch for directions. Other nearby markers. At least 8 other markers are within 6 miles of this marker, measured as the crow flies. La Bahia Road (approx. 1.1 miles away); Thomas Affleck (approx. 1.9 miles away); Waul's Texas Legion Campsite (approx. 2 miles away); Gideon Lincecum (approx. 3.2 miles away); Robert Starke Armistead (approx. 3.8 miles away); Yegua Creek (approx. 3.9 miles away); Somerville Stadium (approx. 5.4 miles away); James W. Lauderdale (approx. 5.6 miles away). Touch for a list and map of all markers in Brenham. More. Search the internet for Glenblythe Plantation, Home of Thomas Affleck. Credits. This page was last revised on March 13, 2019. This page originally submitted on April 1, 2016, by Gregory Walker of La Grange, Texas. This page has been viewed 461 times since then and 16 times this year. Last updated on March 11, 2019, by Larry D. Moore of Del Valle, Texas. Photos: 1, 2. submitted on April 1, 2016, by Gregory Walker of La Grange, Texas. • Andrew Ruppenstein was the editor who published this page.